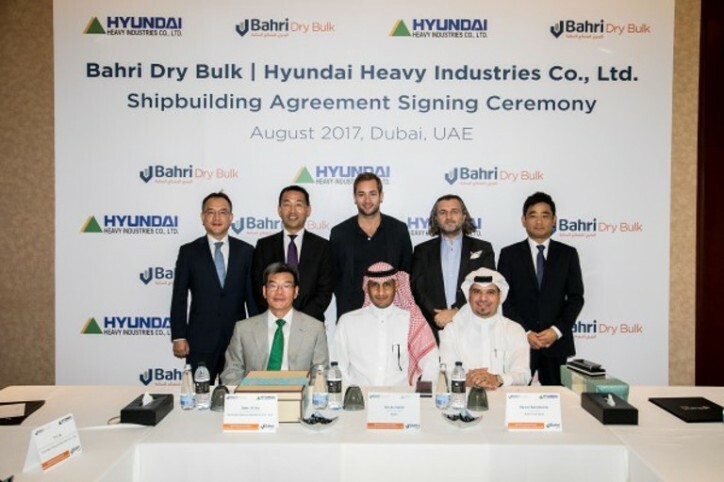 Bahri Dry Bulk, a business unit of Bahri, which is a global leader in transportation and logistics, has signed on Friday, 3 Dhu Al-Hijjah 1438 (25 August 2017) an agreement valued at USD 120 million, to purchase four bulk carriers from Hyundai Mipo Dockyard, a member of Hyundai Heavy Industries (HHI) Group, which owns one of the largest state-of-the-art shipyards in the world.The agreement was signed in Dubai, UAE, in the presence of Mr. Ali Al-Harbi, Acting CEO of Bahri, Mr. Nezar Banabeela, President, Bahri Dry Bulk, Mr. Sam. H. Ka, President & COO, Hyundai Heavy Industries (HHI) Group, in addition to other executives from both the companies. With construction commencing immediately, each vessel will be built to the highest environmental, fuel-efficiency and safety standards, with a capacity to carry up to 80,000 metric tons per voyage, and will be delivered during the year 2020. “Bahri’s long-standing relationship with Hyundai Heavy Industries Group bears testimony to the success of the bilateral ties between Saudi Arabia and South Korea, and Bahri and HHI’s shared values for long-term growth. HHI Group brings decades of expertise in shipbuilding and its sustained focus on quality has contributed to their position as one of the most highly-regarded names in the industry,” said Ali Al-Harbi, Acting CEO of Bahri. “The addition of four new vessels to our fleet is firmly aligned with Bahri’s long-term strategy for expansion and diversification. Upon delivery, the vessels will contribute towards the growing demand Bahri Dry Bulk is witnessing for the import of essential grains such as barley, wheat and corn into the Kingdom,” added Al-Harbi.